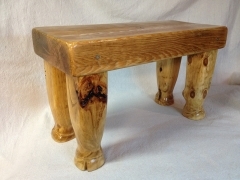 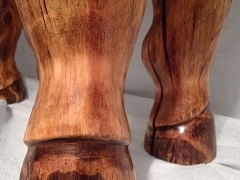 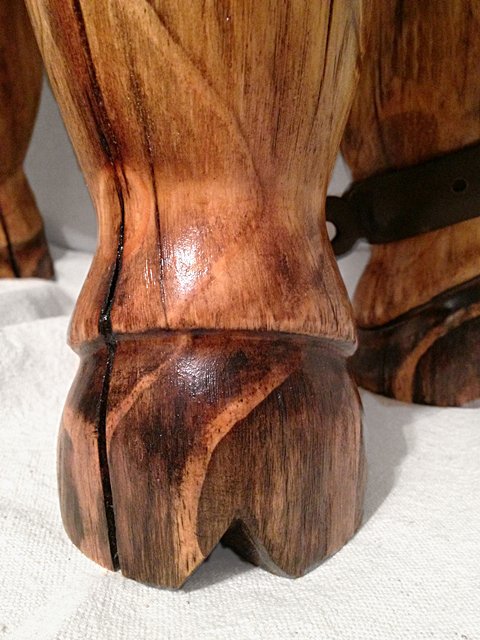 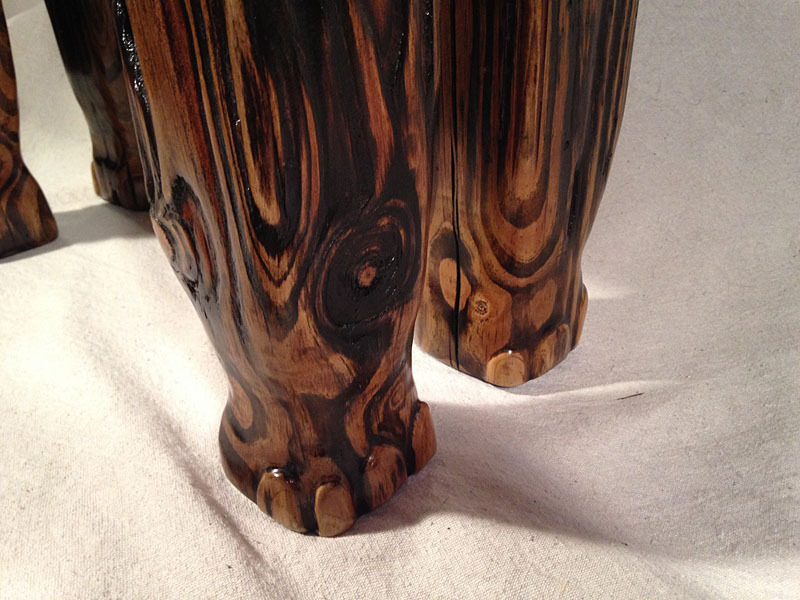 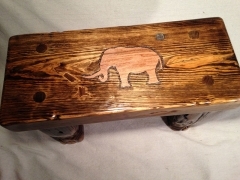 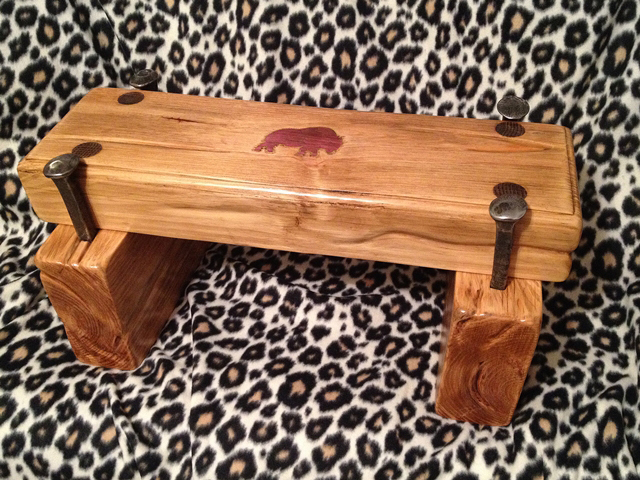 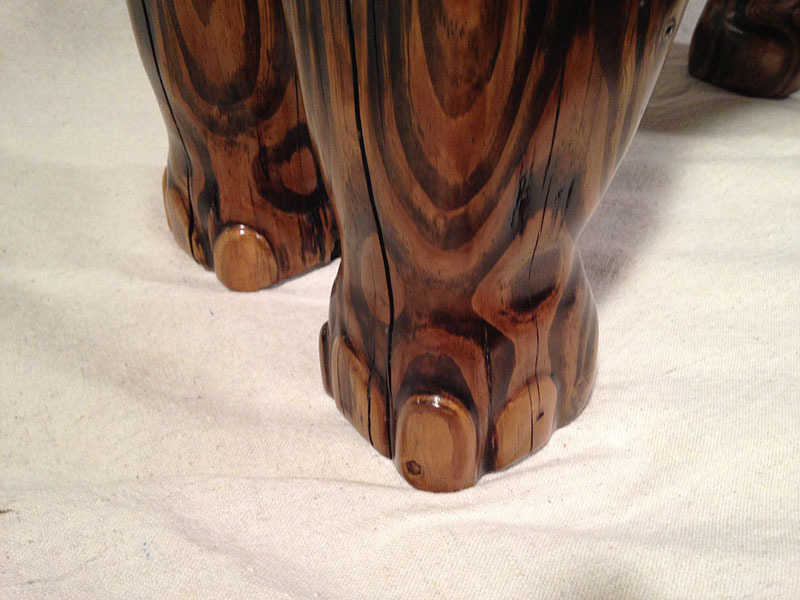 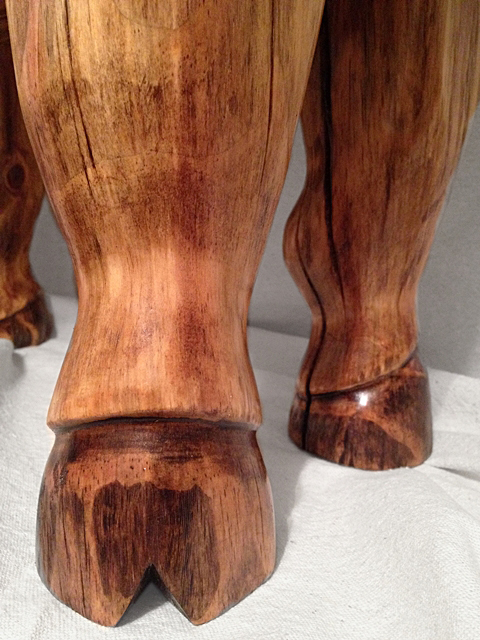 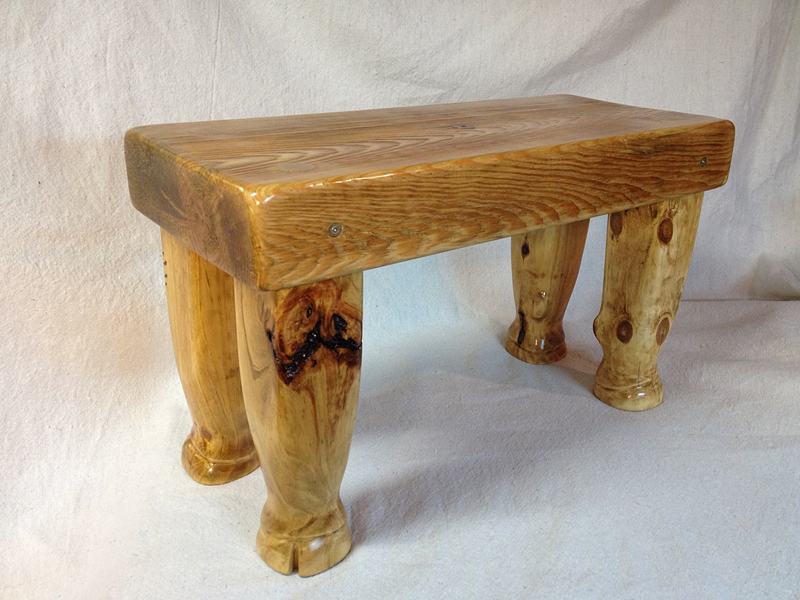 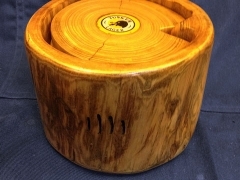 Hoof Rest is a solid pine foot stool to rest your hooves on after a long day on the Savannah. 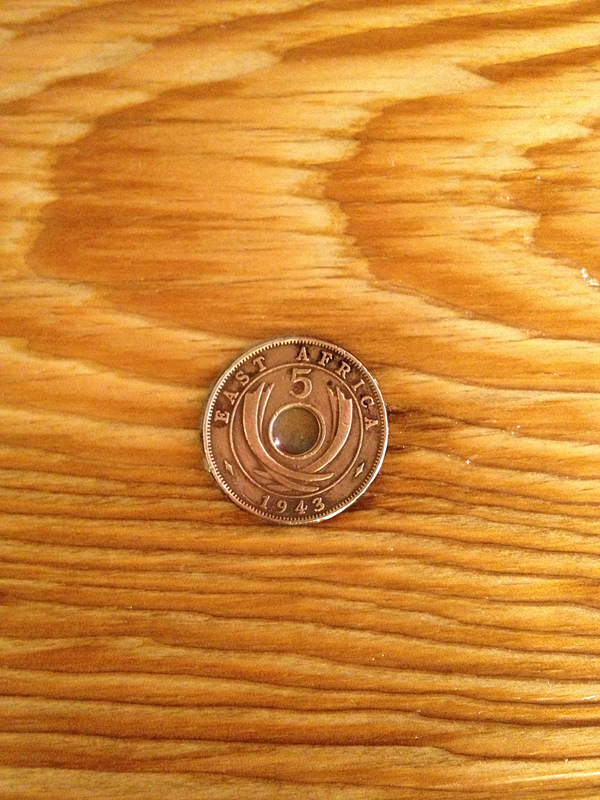 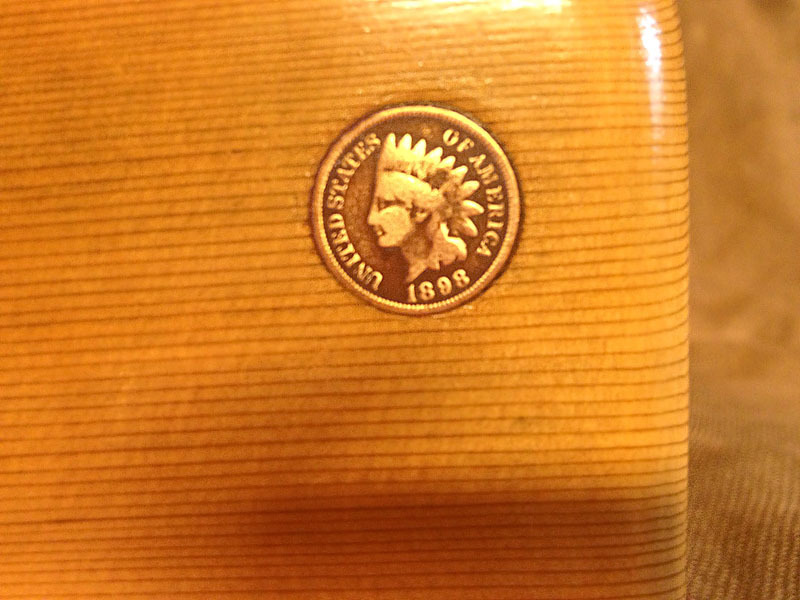 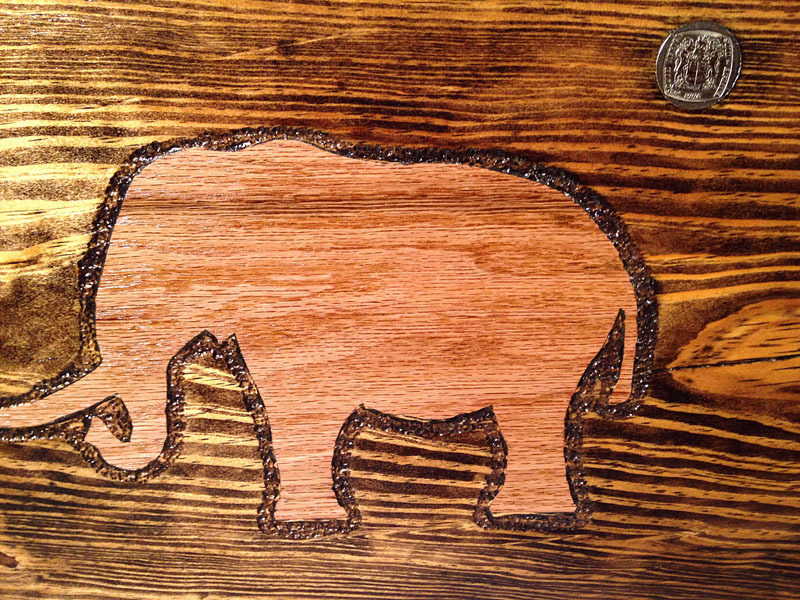 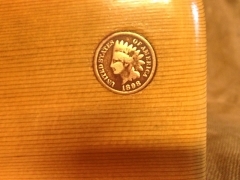 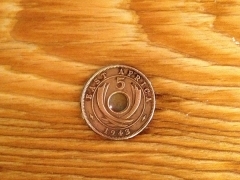 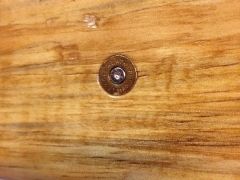 It’s top is inlaid with a 1943 East African coin. 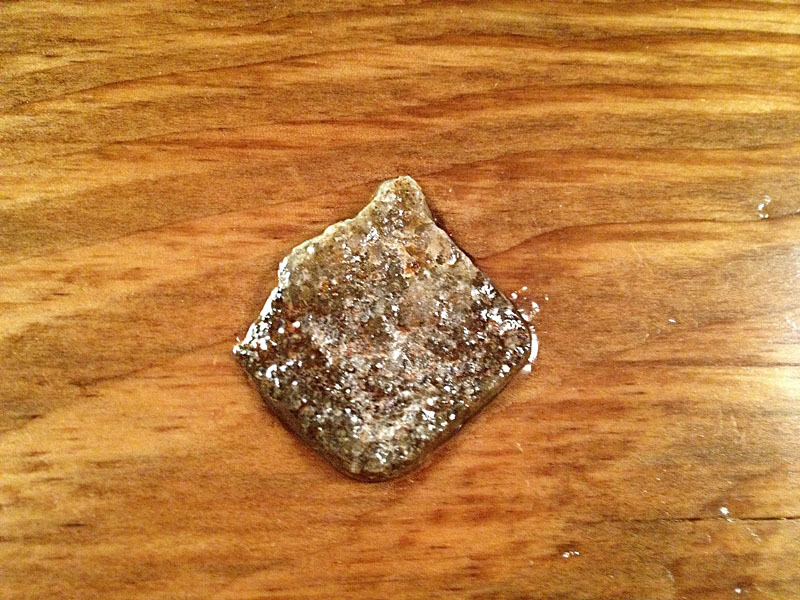 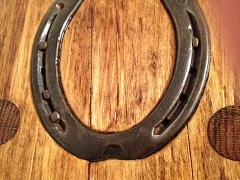 Two of the hooves have “stepped on” beer caps embedded in them. 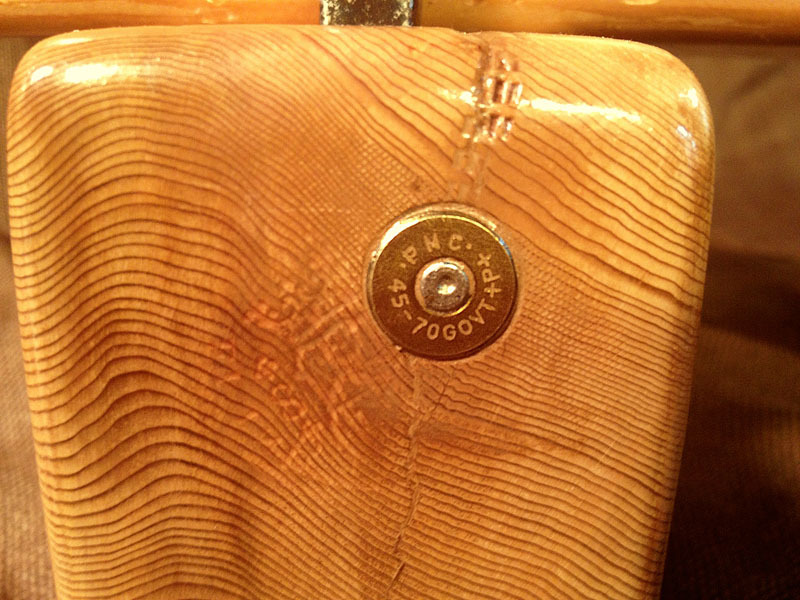 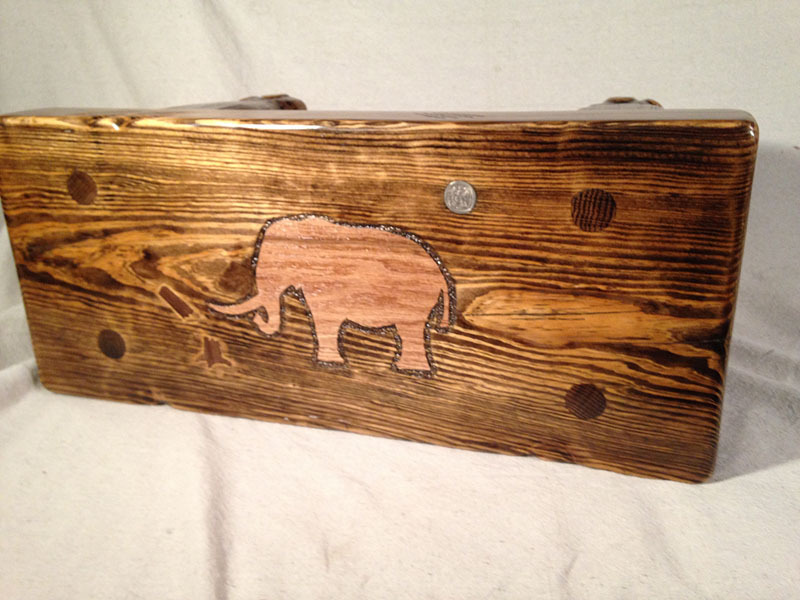 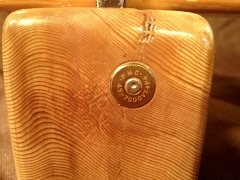 The side corners are decorated with rifle cases. 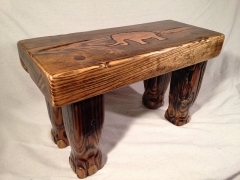 Caution: This species is territorial and can bite, stomp or claw other furniture. 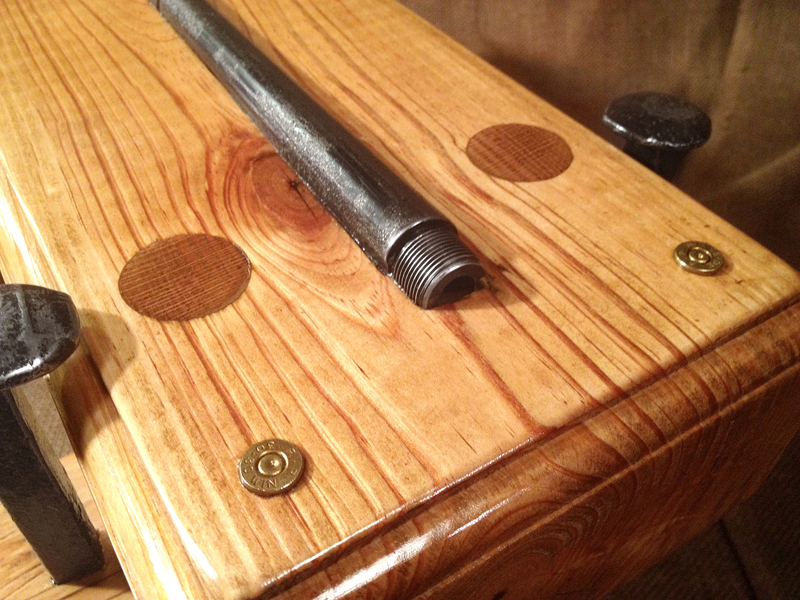 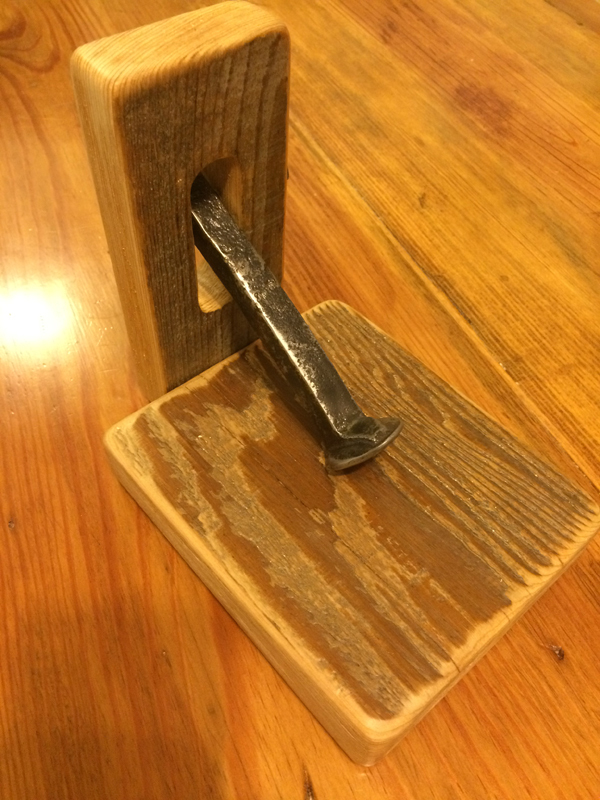 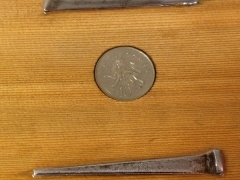 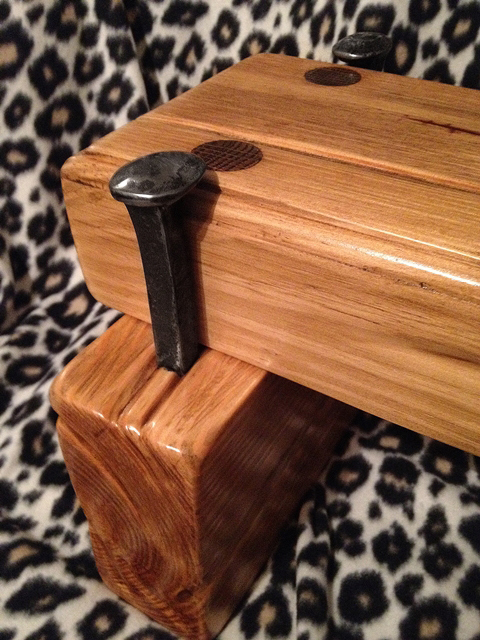 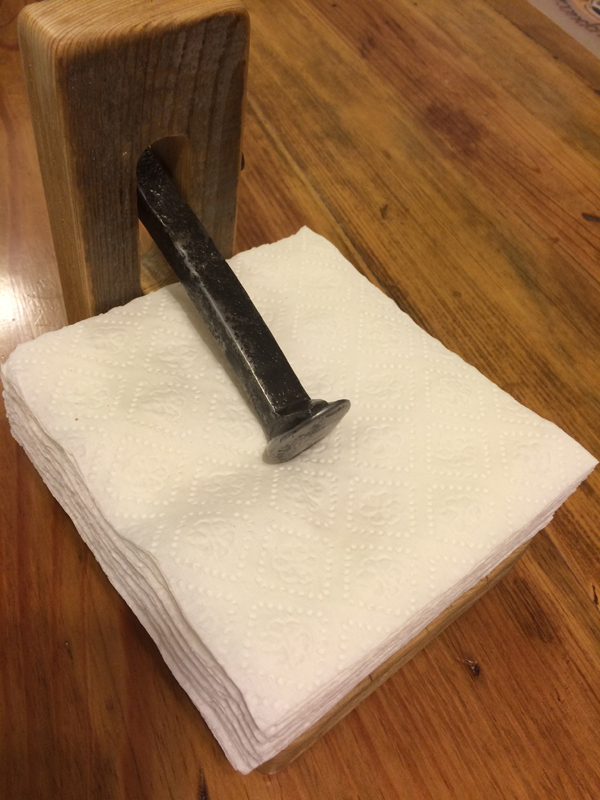 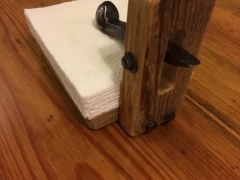 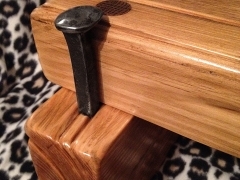 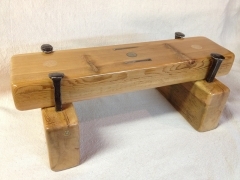 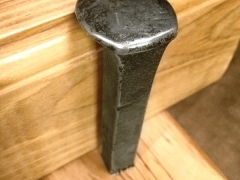 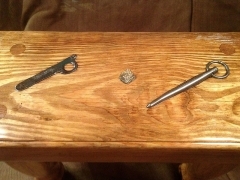 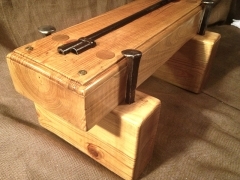 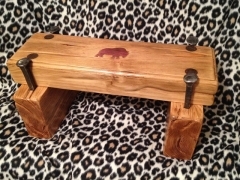 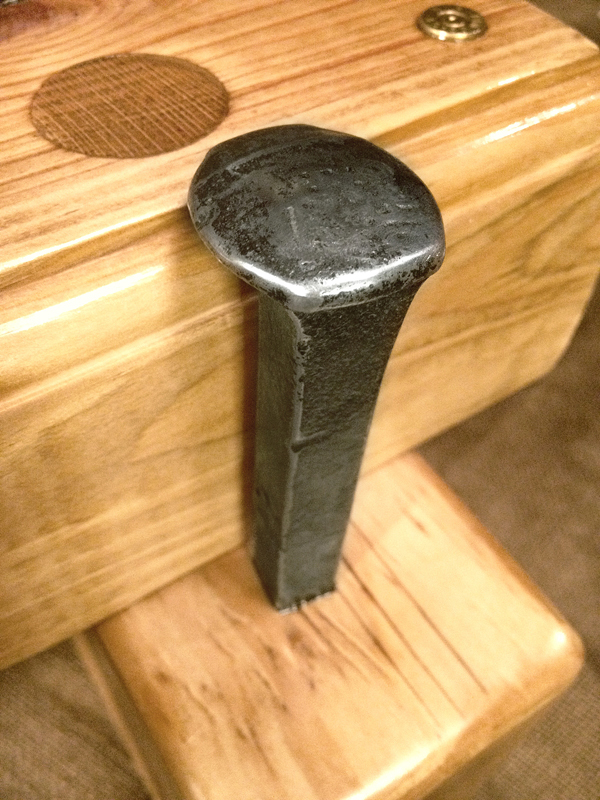 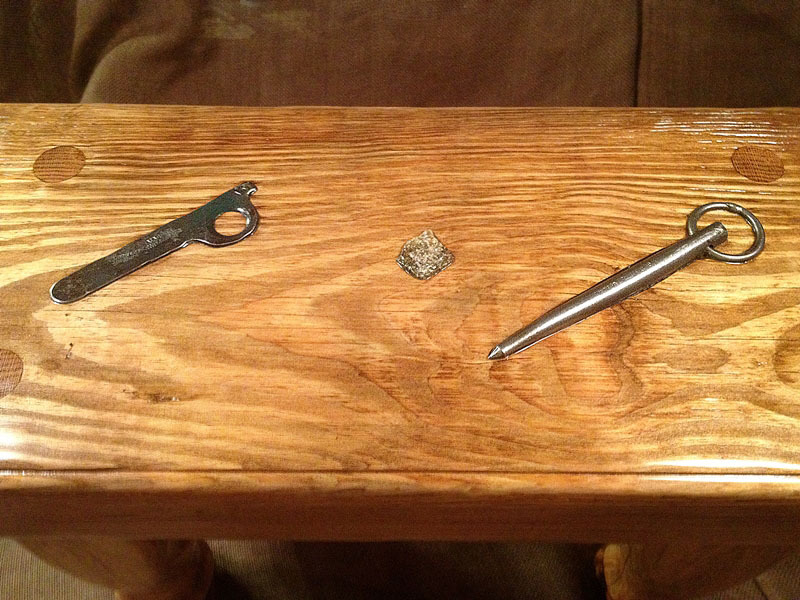 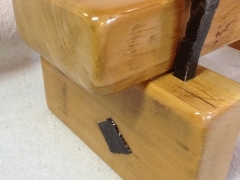 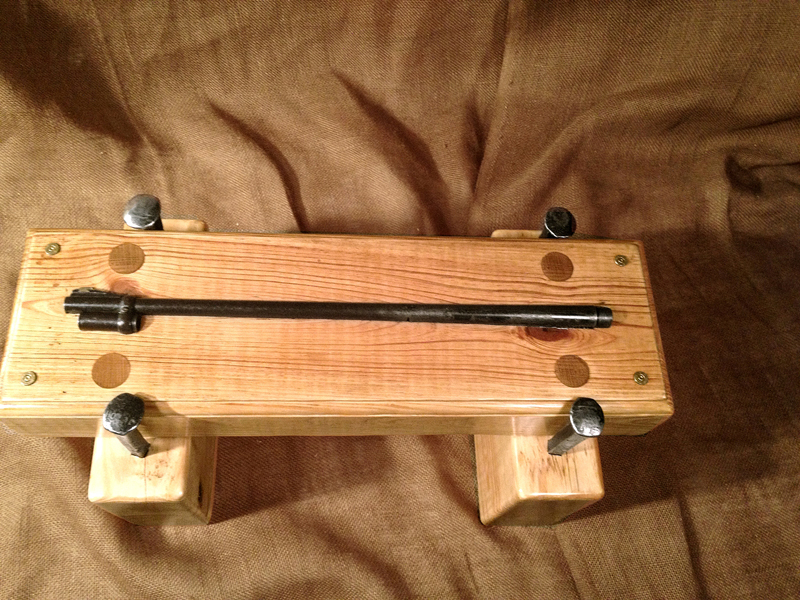 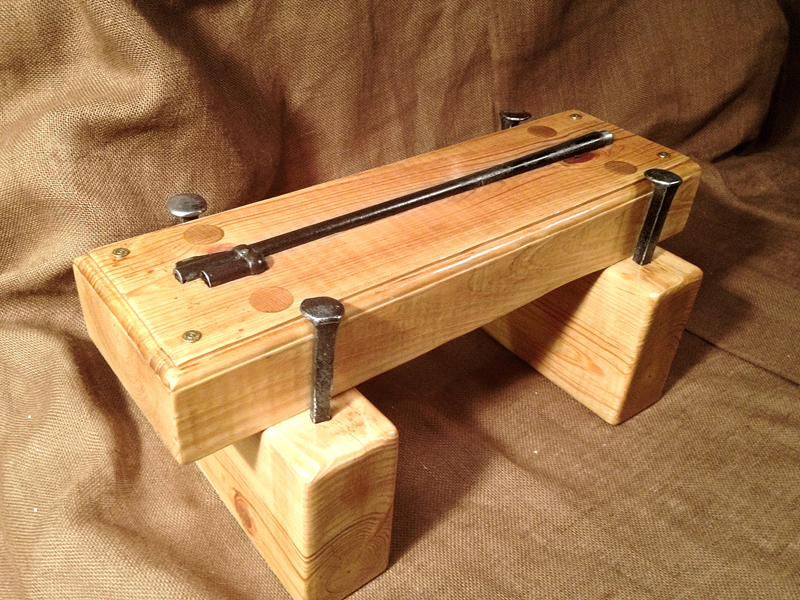 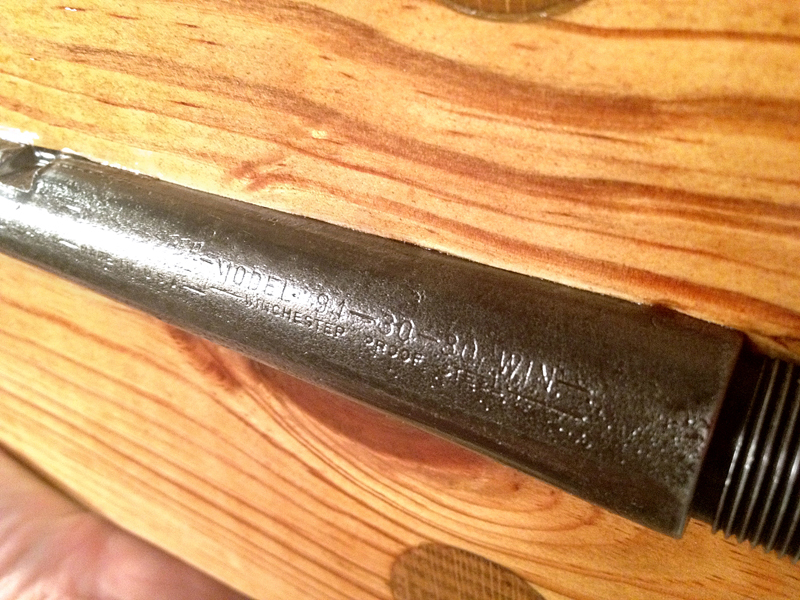 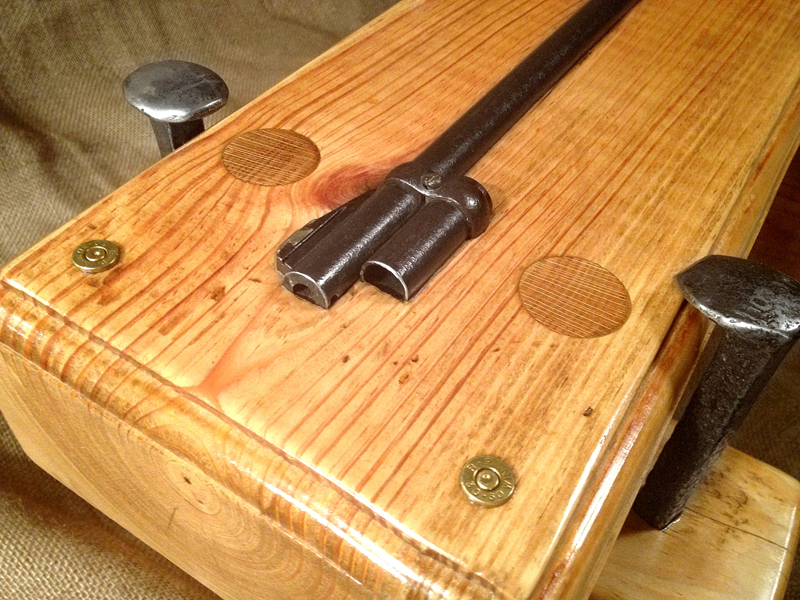 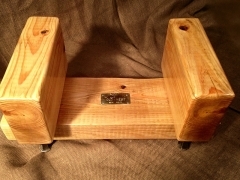 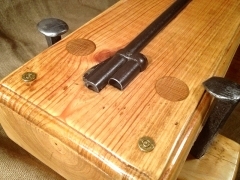 Uganda Railway “boarding step” (foot rest) is solid cedar inlaid with real antique railroad spikes, British and American coins, old square nails and a piece of interesting old steel that was found in a forest in Europe. 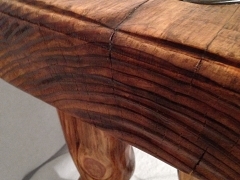 This foot rest celebrates the old Uganda Railway which was made famous by its Tsavo man-eating lions. 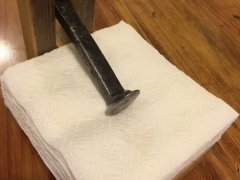 Caution: This species is territorial and can stomp, kick, or bite. 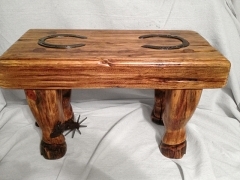 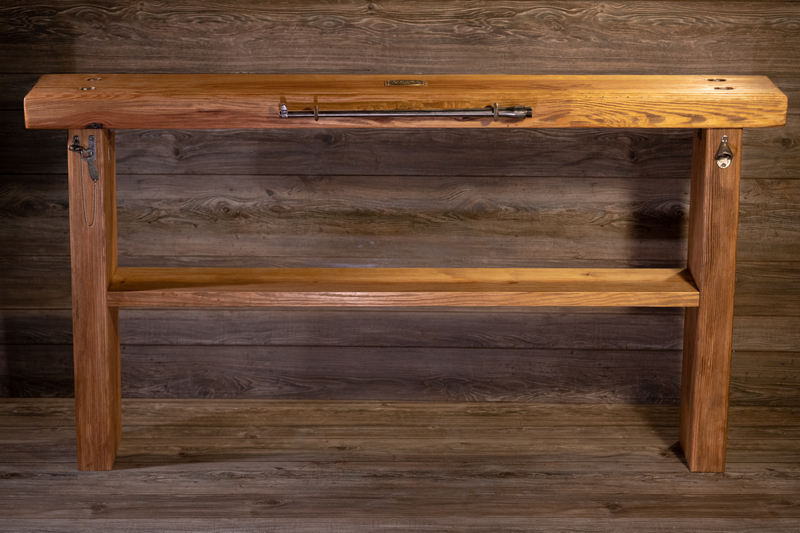 “Old West” is a solid pine footstool inlaid with a beautiful antique model 94 Winchester barrel, 30-30 case bases and antique railroad spikes. 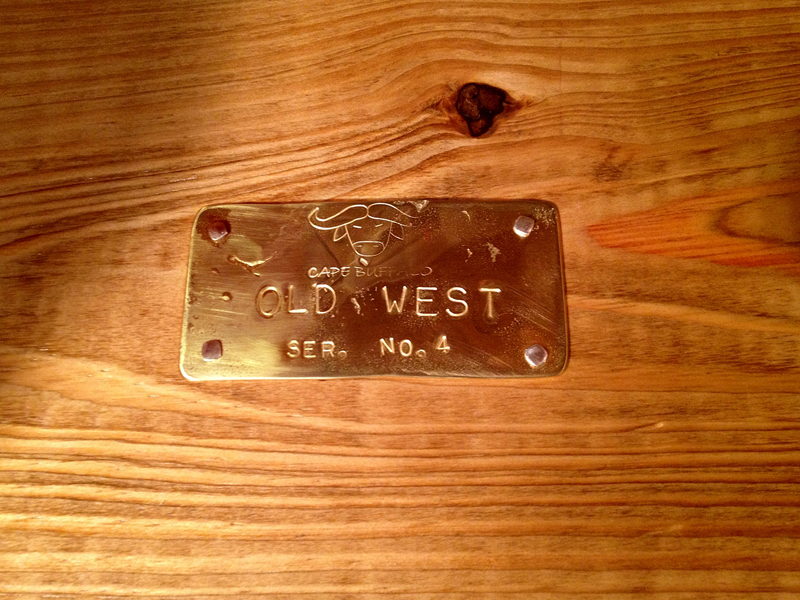 This footstool celebrates the spirit of the old west and all of it’s incredible, classic adventure. I fell in love with this barrel immediately when I first saw it – really sweet – a true classic for the western adventure lover. 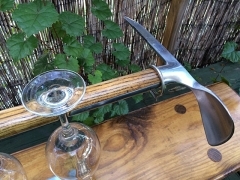 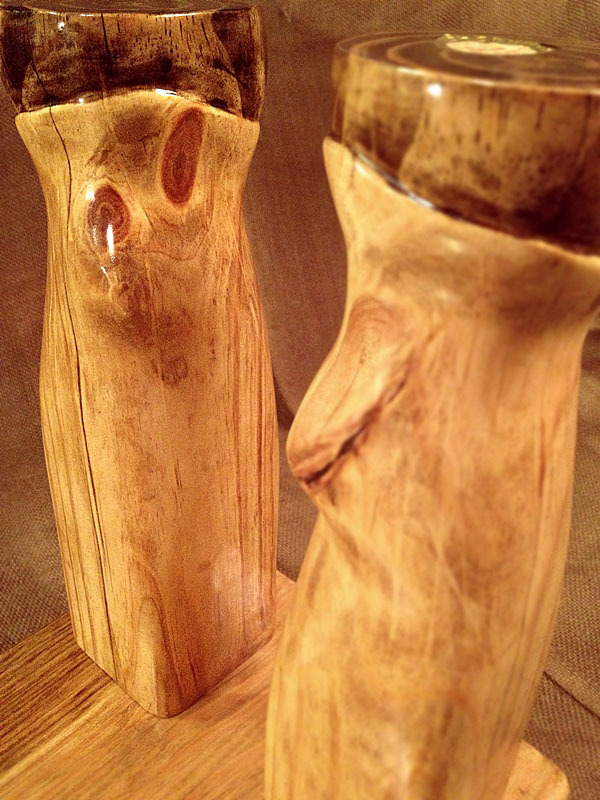 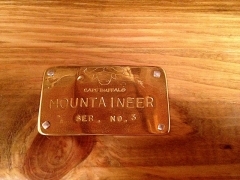 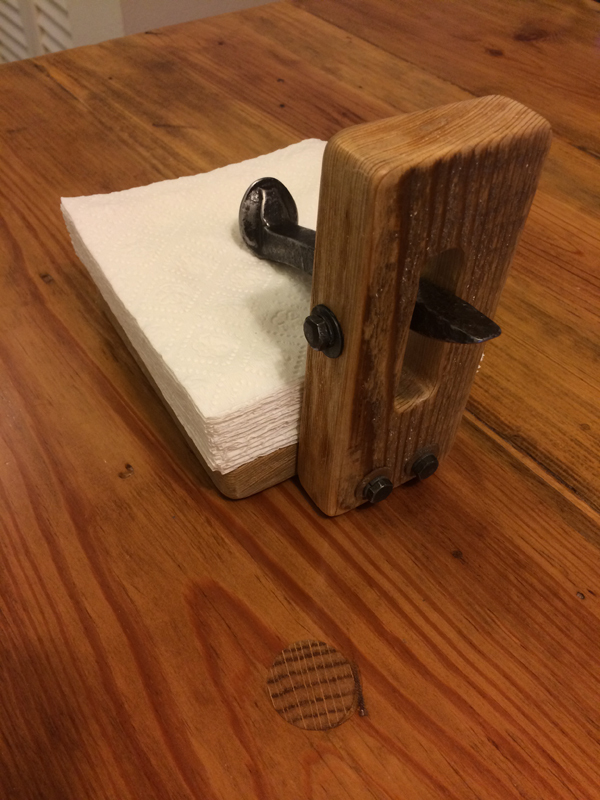 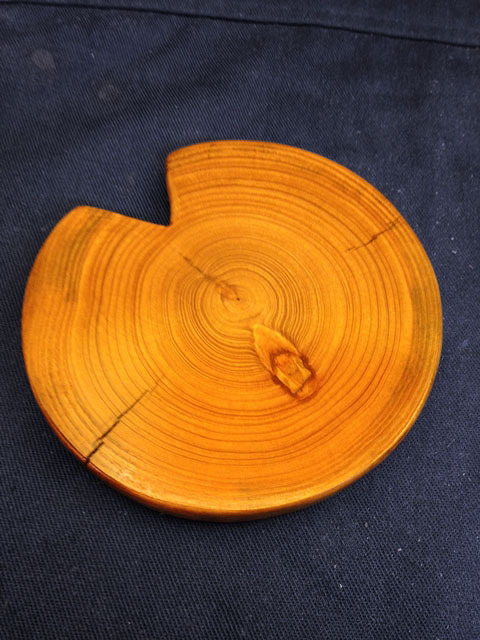 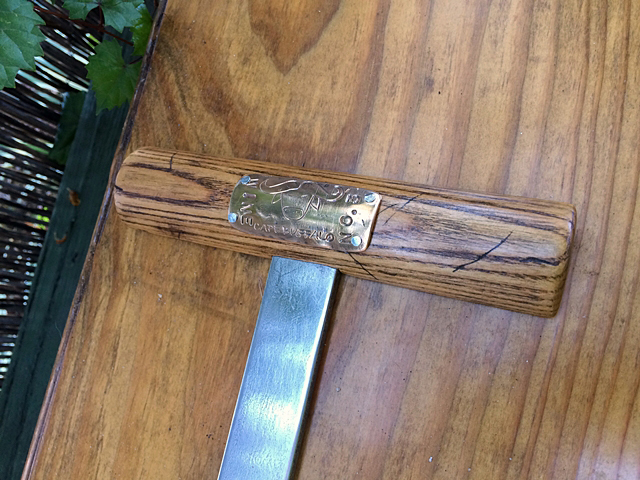 “Mountaineer” is a solid pine hoof rest celebrating the adventure of mountaineering. 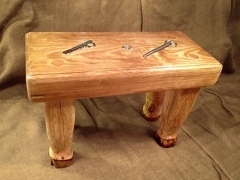 The top is inlaid with real antique pitons from the Fritsch & Co. of Zurich Switzerland and an actual piece of the Swiss Alps. 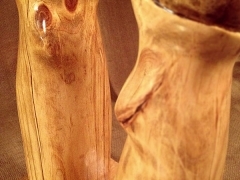 I chose this little piece because to me, it looks like a miniature Matterhorn. 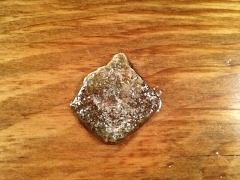 This rock was found on a hike near Zermatt Switzerland. 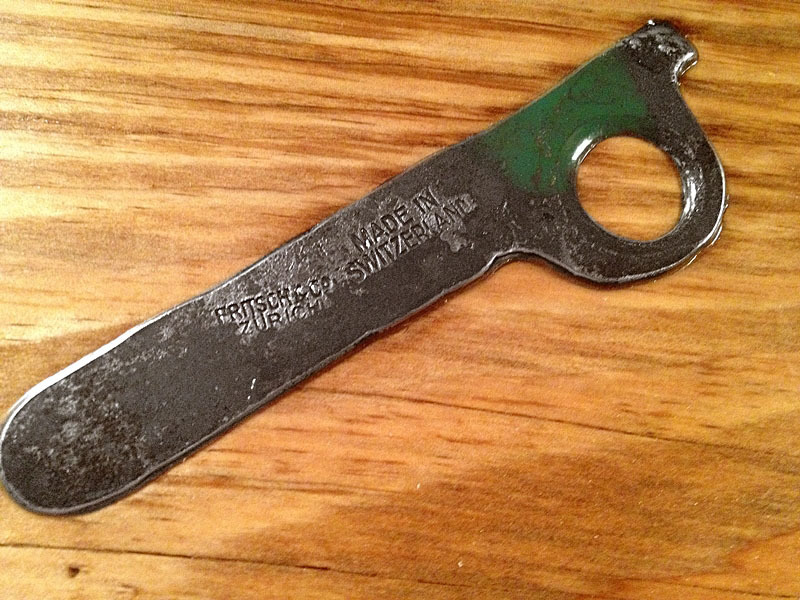 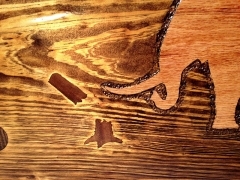 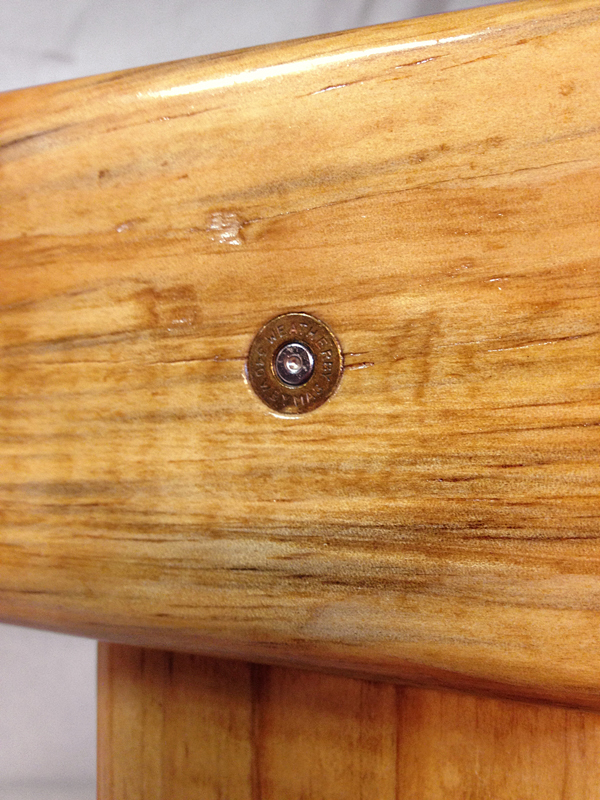 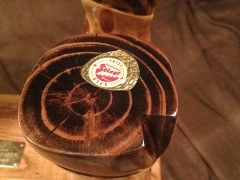 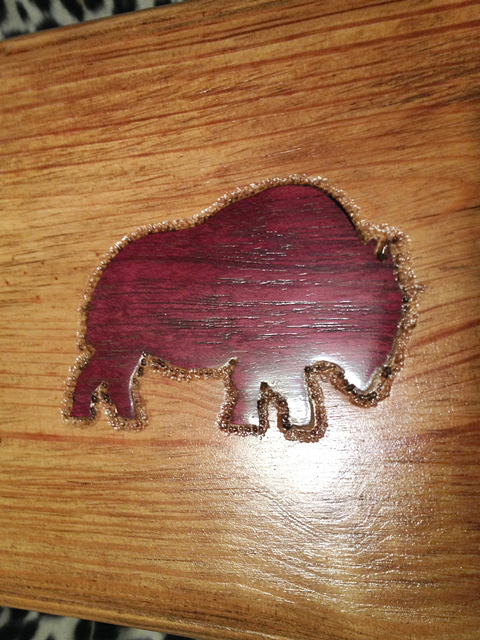 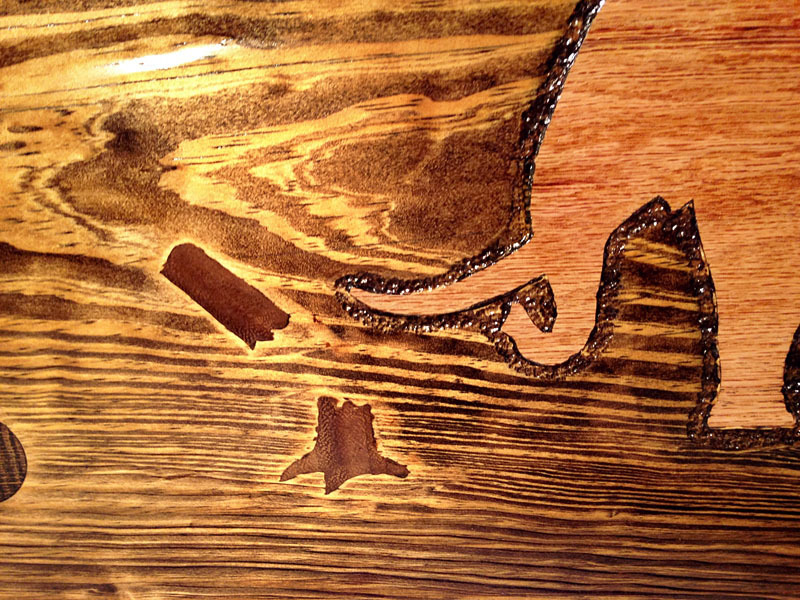 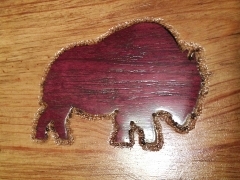 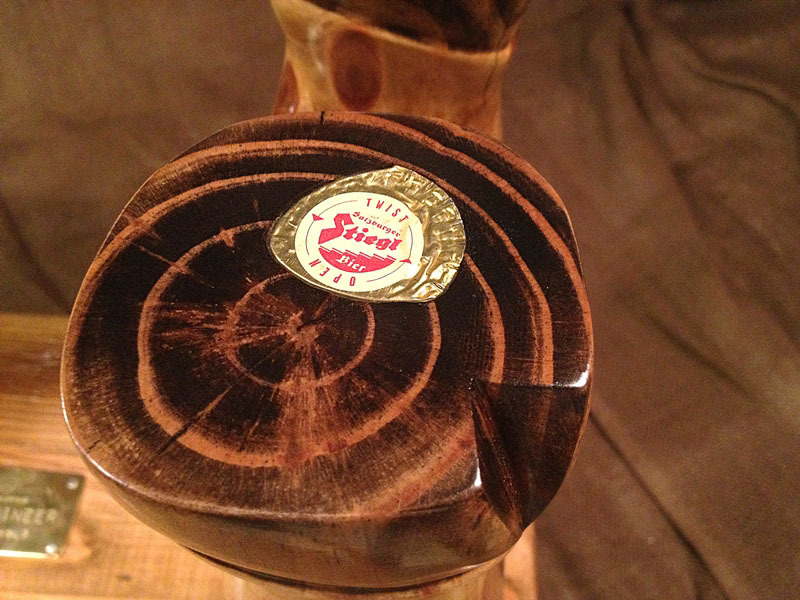 There is also an Austrian beer cap inlaid into the bottom of a hoof. 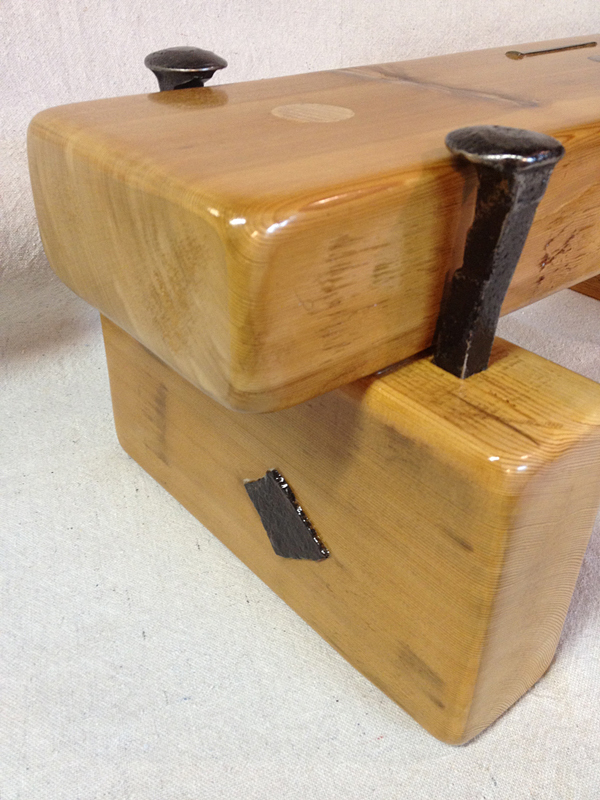 The pitons and rock are inlaid but left about 1/4 ” higher than the wood so they can be felt and seen better. 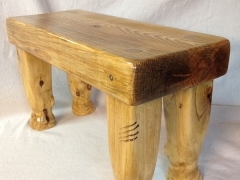 Of course you can sit on them and you do feel them a little, but is still comfortable. 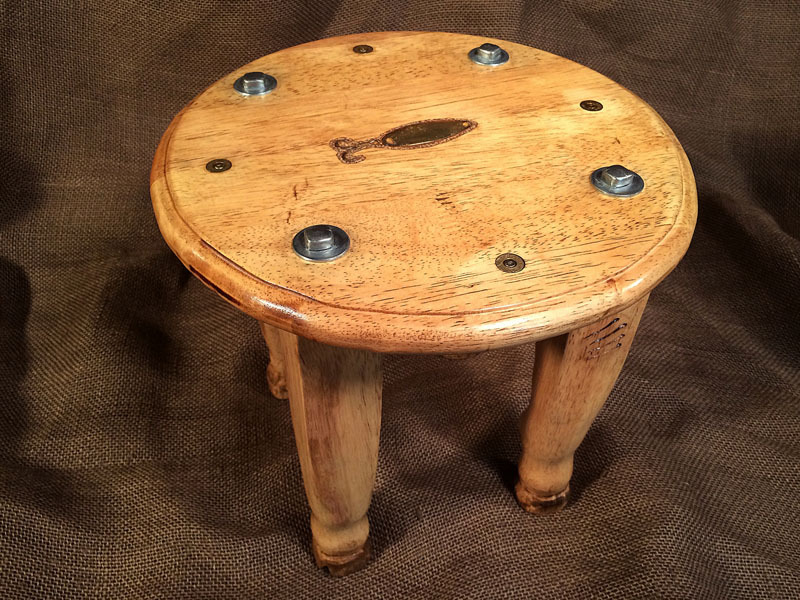 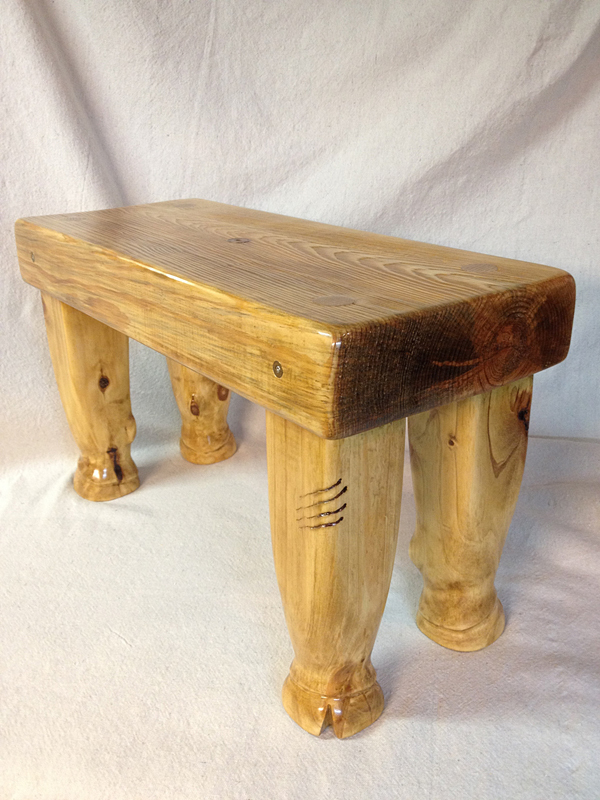 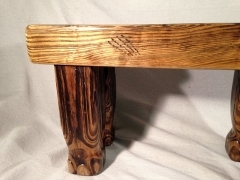 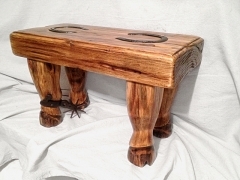 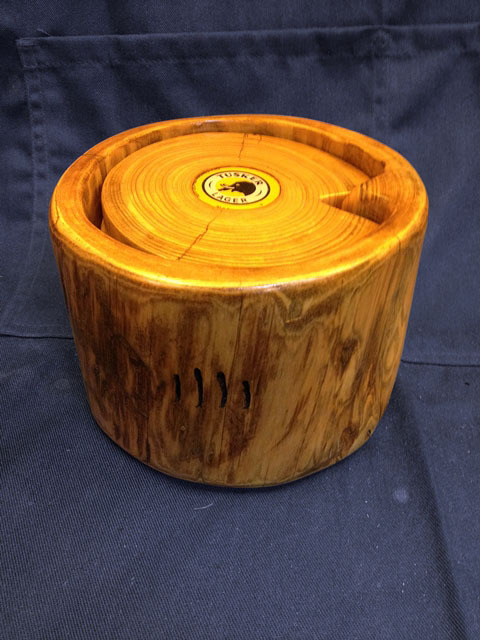 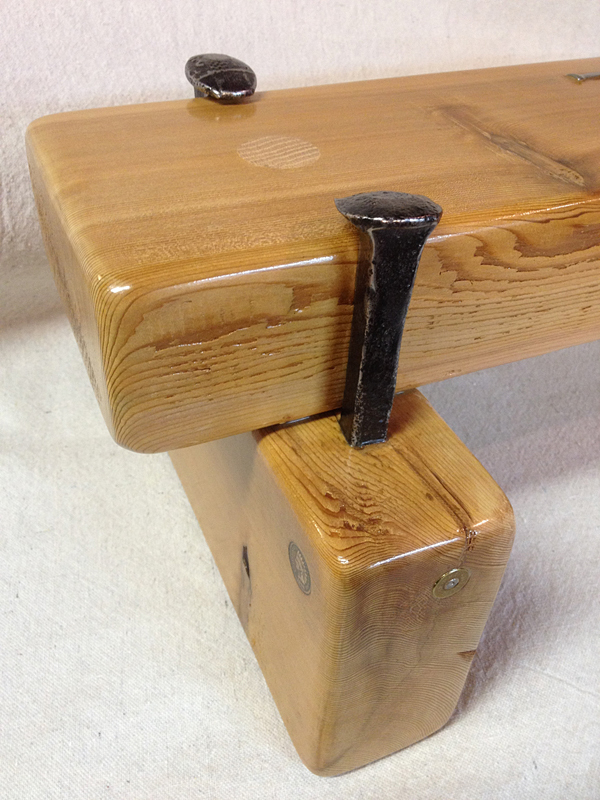 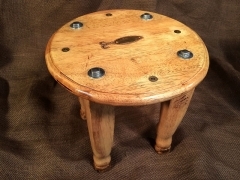 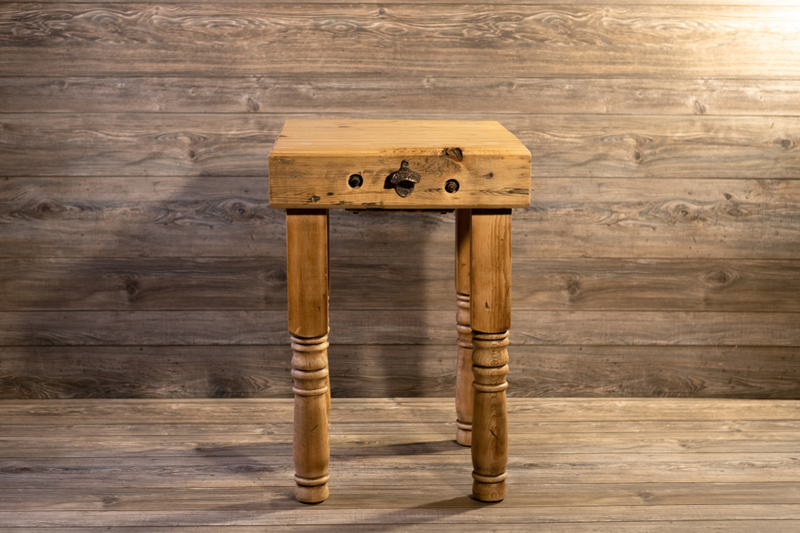 Solid Pine stool with inlaid rosewood (I believe) bison, oak bolt covers and antique spikes. 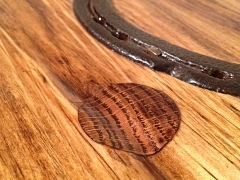 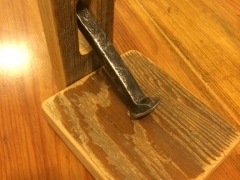 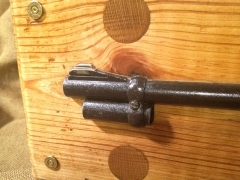 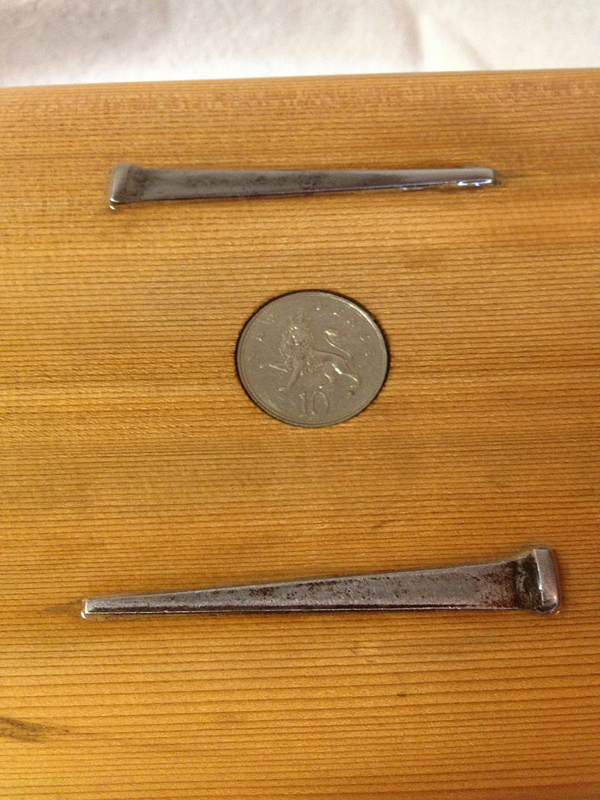 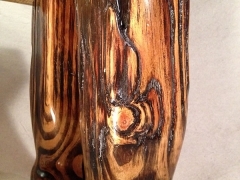 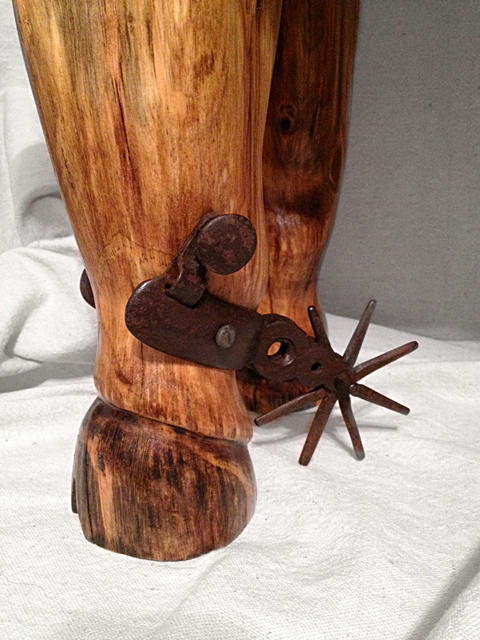 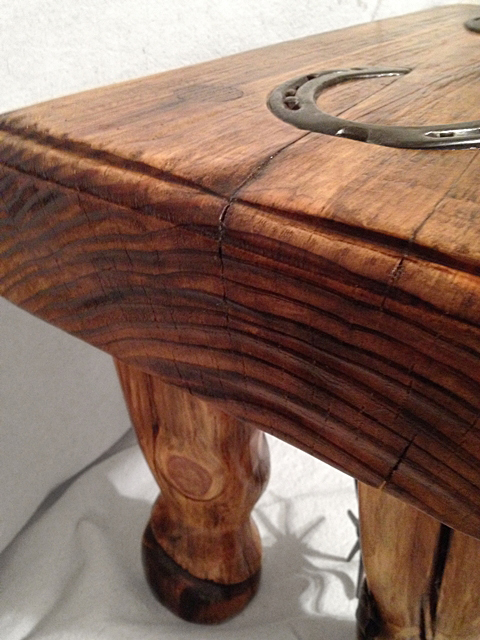 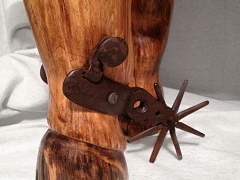 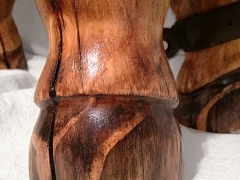 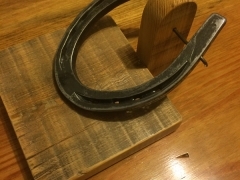 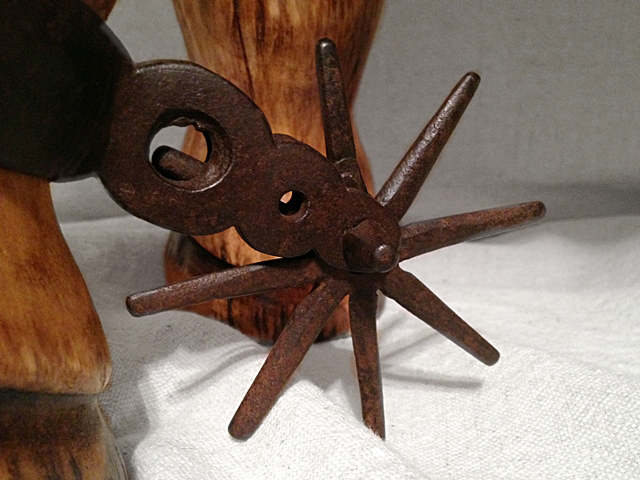 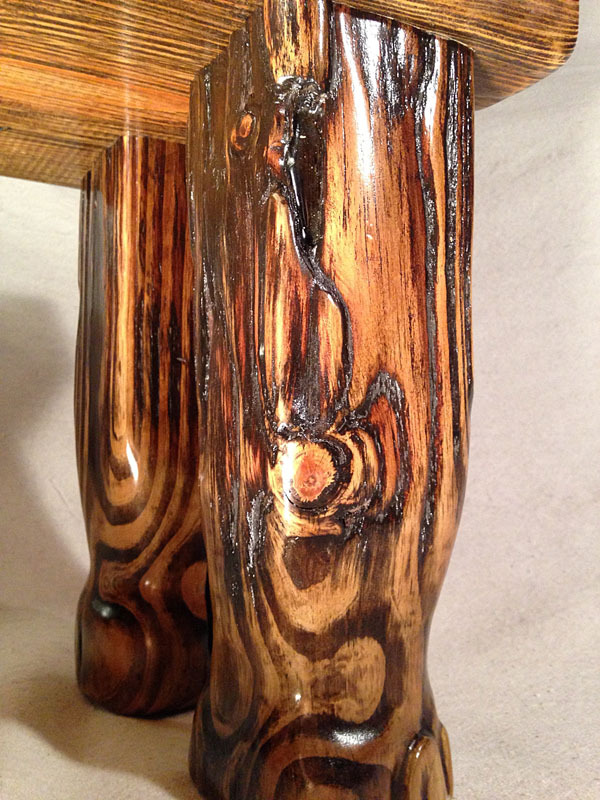 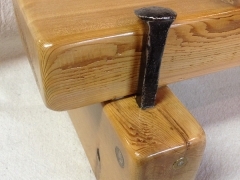 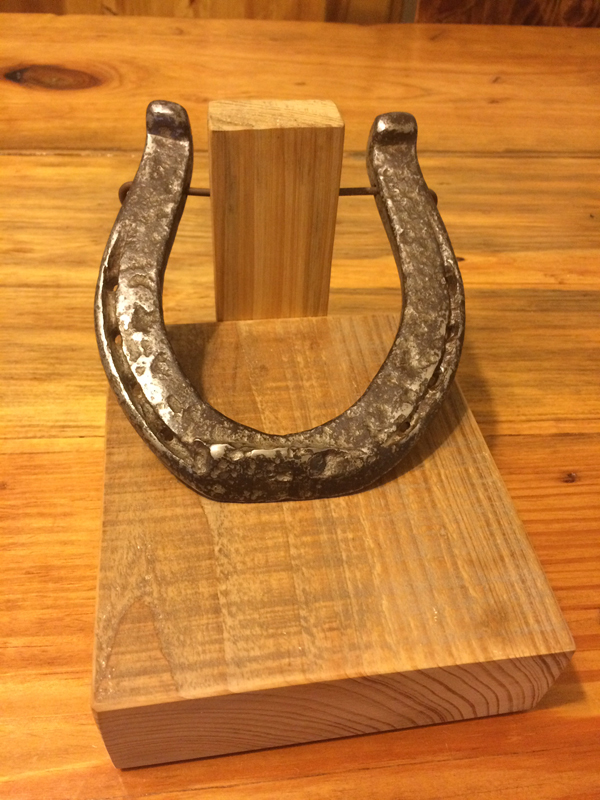 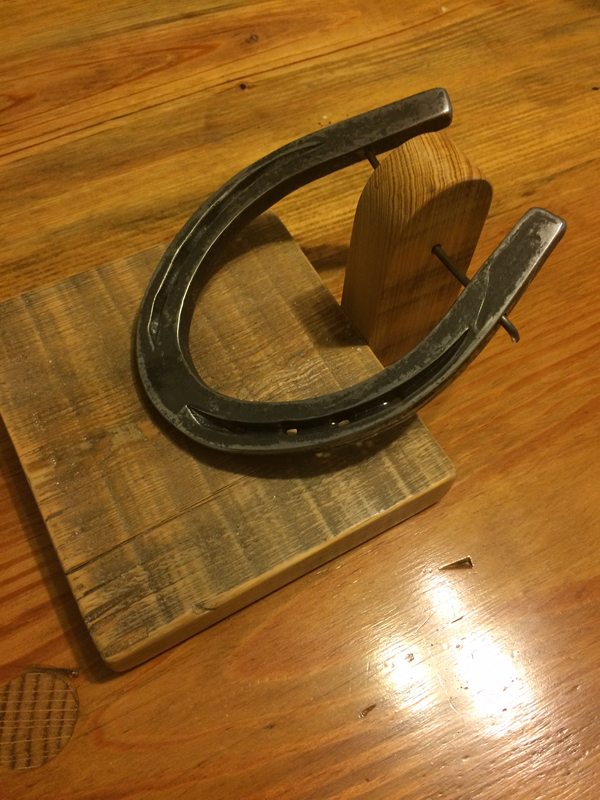 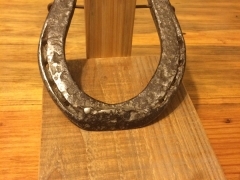 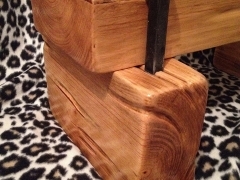 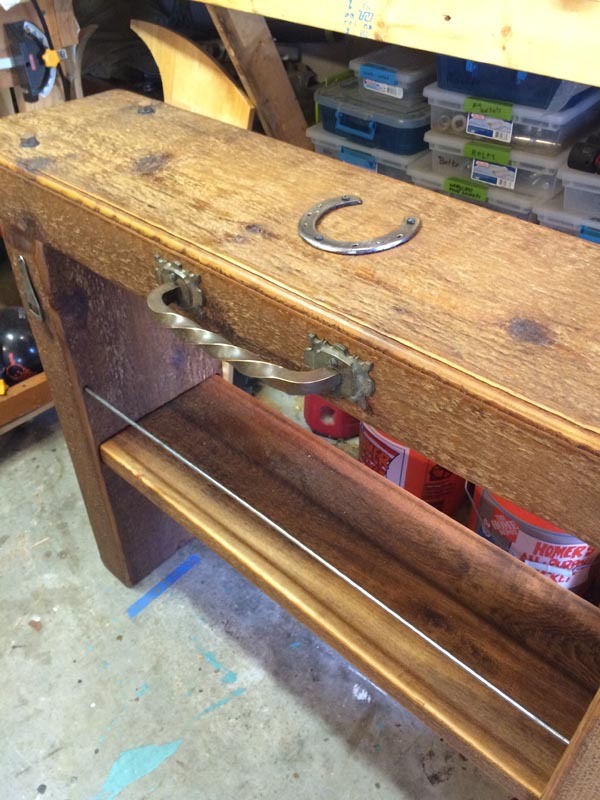 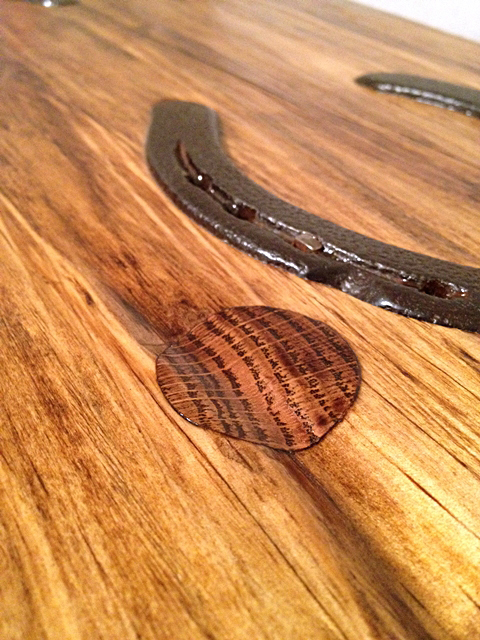 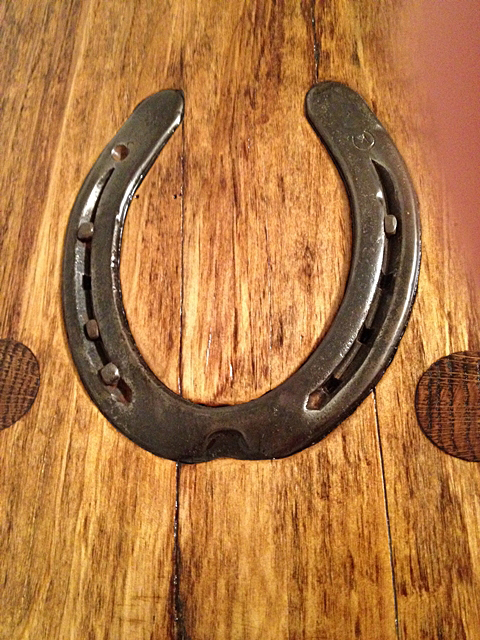 Solid Pine with really nice inlaid antique horseshoes and very cool antique spur on one leg. 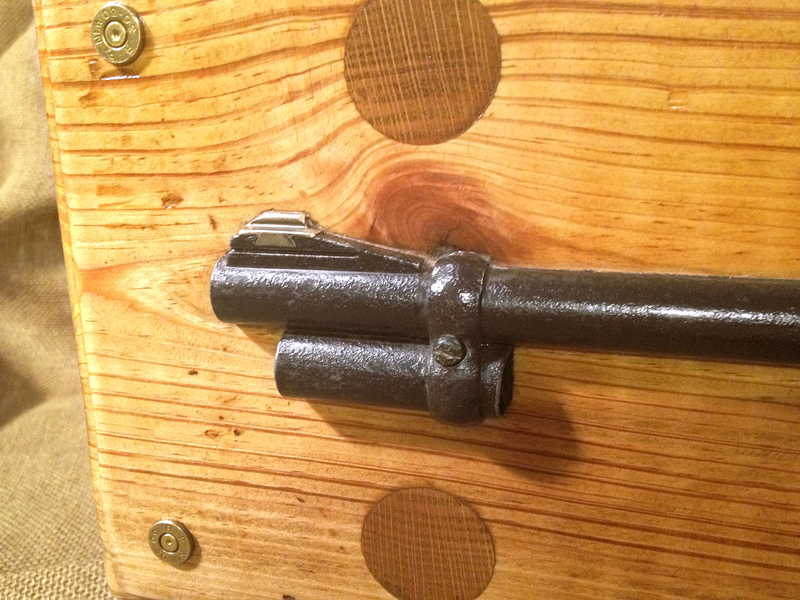 1880’s spur from Chihuahua Mexico according to seller and antique dealer but is not marked. 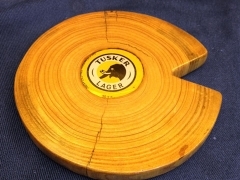 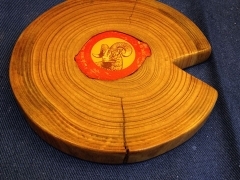 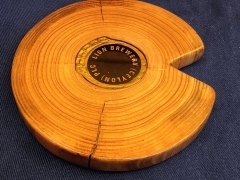 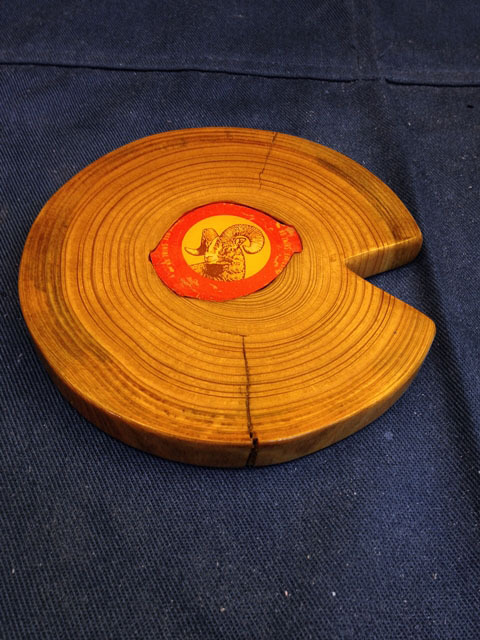 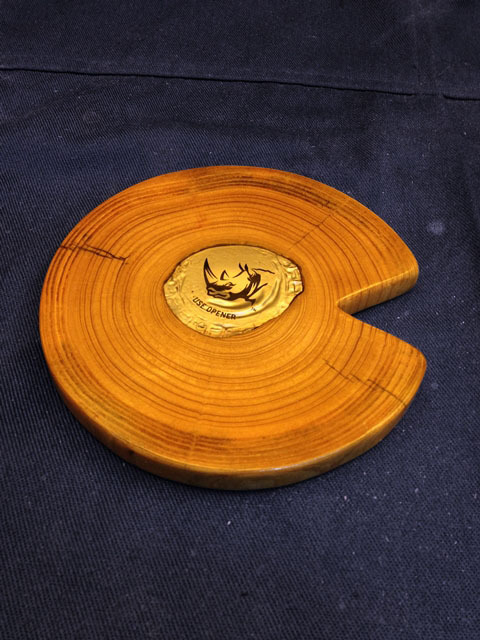 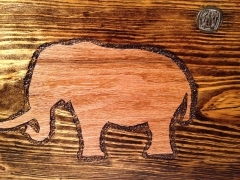 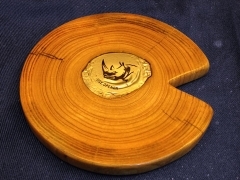 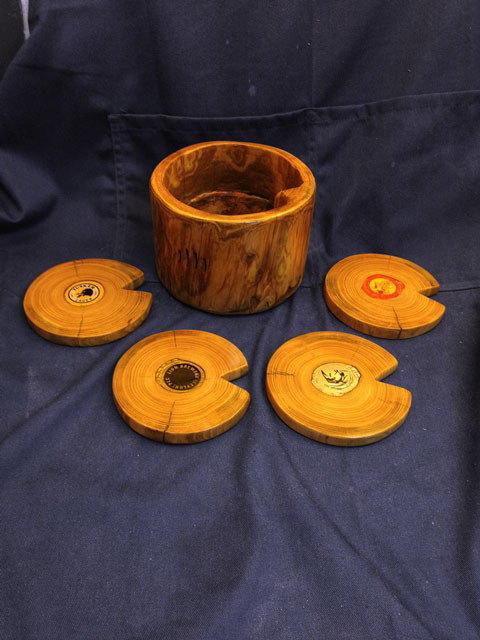 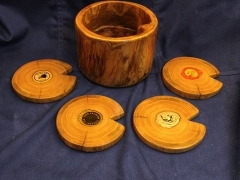 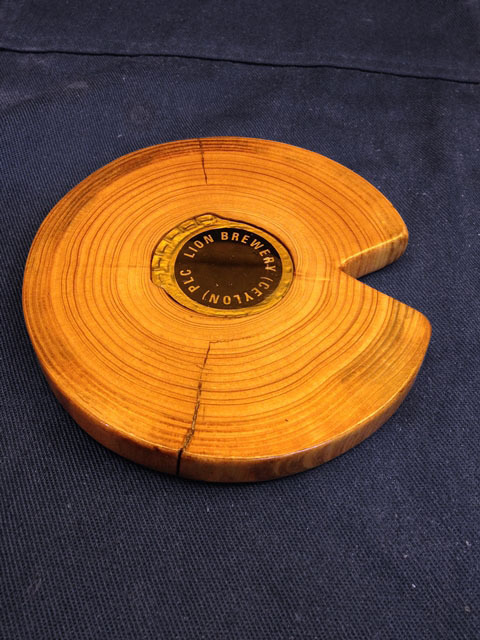 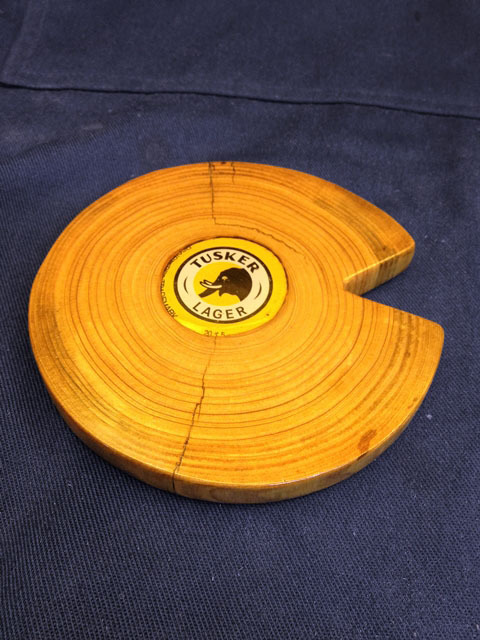 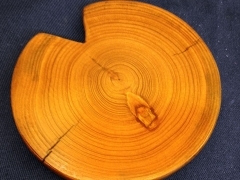 Hand-carved hoof coasters inlaid with four different flattened beer caps. 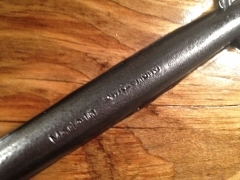 Real antique ice ax that I bought in a small village in Switzerland. 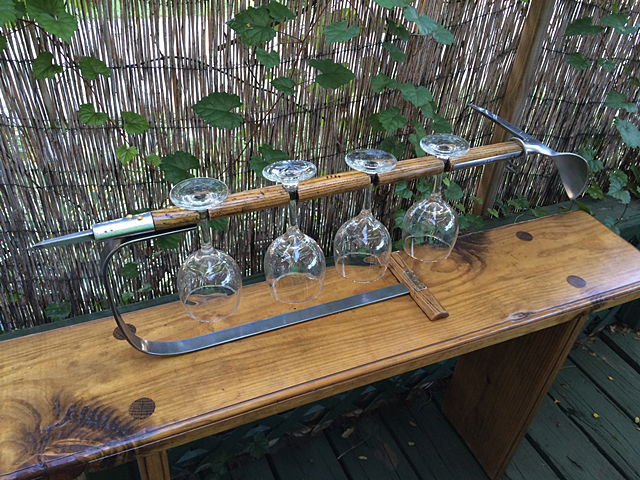 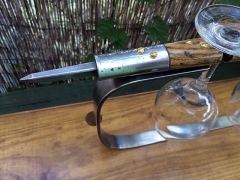 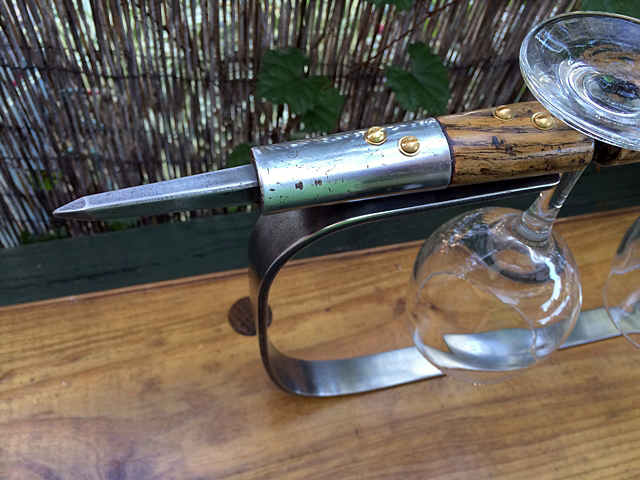 Cleaned up, beautifully finished and made into a wine glass holder. 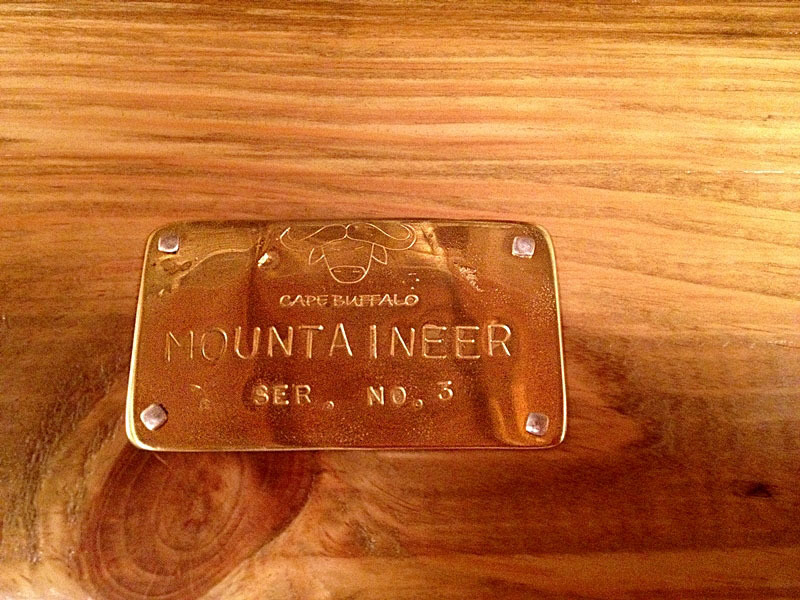 Celebrating the awesome adventure of mountaineering. 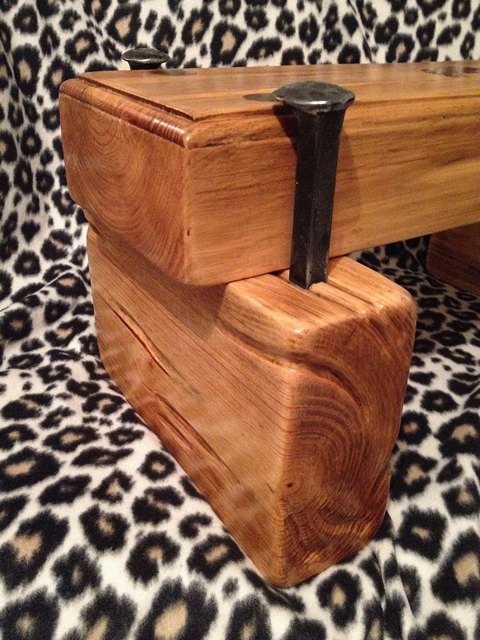 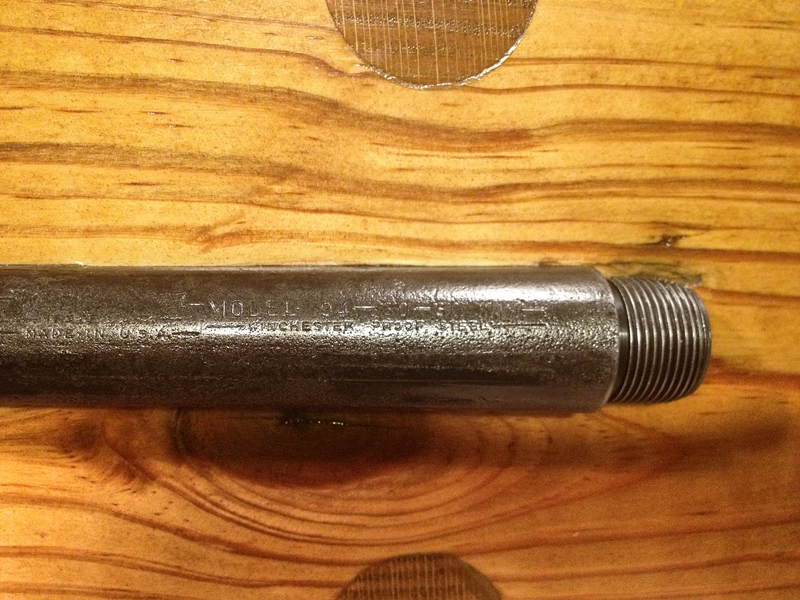 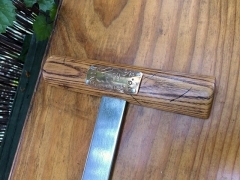 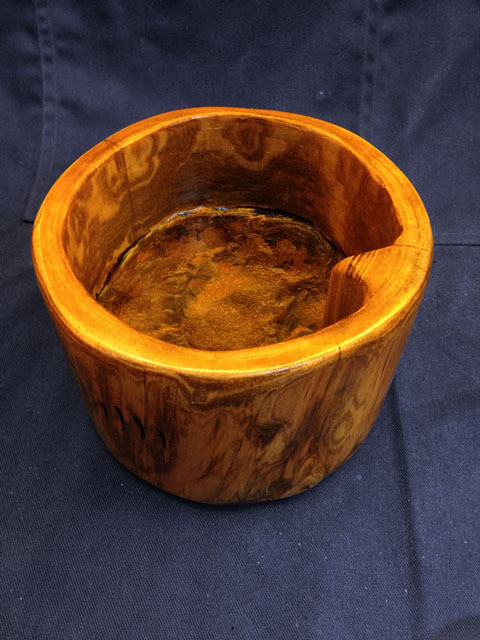 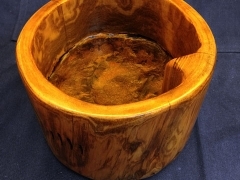 Solid steel and oak base.